.I first ran across The Assassin’s Curse a couple weeks ago on someone’s ‘Waiting on Wednesday’ post. Unfortunately, I no longer remember whose blog that was, but I feel the need to say, “Thank you!” Thank you wonderful, unknown blogger with exquisite taste in books, for putting this novel on my radar. As I read the blurb on that Wednesday not so long ago, I was practically drooling on my keyboard, and I knew that this book is one I definitely had to get my hands on and as soon as possible. Turns out I was right. It is fantastic. From the wild, impulsive Ananna, to the intriguing, mysterious Naji, to the impossible curse, to the quest they find themselves on, The Assassin’s Curse is a compelling adventure from cover to cover. Ananna. The first thing I noticed about Ananna — and it’s apparent from the very first line — is her way of speaking. It’s unpolished, rough ‘n tumble, grammatically incorrect… and it really grew on me. It helps accentuate the fact that Ananna was not raised a lady, not formally educated, but rather she grew up among bilge rats with a sword in her hand learning to plunder and pillage and do all manner of piratey things. While Ananna lacks a formal education, she’s incredibly street smart, a skilled fighter, a quick study, cool-headed, and due to her background in thievery, is excellent at sizing up situations and people. She tends to be more wary and distrustful – always trying to determine the angle or agenda of others. But she’s also fierce, fiery, passionate, impulsive, outspoken, with a unique sense of honor and a defining inner strength that’s apparent to the reader, even if she isn’t always able to recognize it herself. Although passionate, Ananna doesn’t seem the type to be overly emotional and dramatic, but because of her unorthodox situation, we do get wonderful glimpses of her fear, uncertainty, and confusion as she navigates both her circumstances and her strange connection to Naji. Naji. Speaking of Naji, he’s a mystery wrapped up in an enigma, served with a special side of question mark sauce. Because this book is narrated by Ananna we see him through her eyes only, therefore we only know about him what she herself has learned, and that’s not a whole heck of a lot. Naji… well, he plays it a bit close to the vest. A Jadorr’a, Naji is a member of an ancient order of assassins, lethal and trained in the art of blood magic (a.k.a – dark magic). Intimidating? Yeah. Just a tiny bit. And being bound via curse to Ananna wasn’t exactly part of his plan. It’s thrown this tough and deadly assassin for a bit of a loop being stuck with this intriguing and feisty pirate princess… who also happened to be his mark. He’s rather desperate to rid himself of the curse, and by extension, protect Ananna until that time comes. Though very much a mystery – as in the I’d-tell-you-but-then-I’d-have-to-kill-you kind of mystery – there are definitely some discernible things about Naji that really made him an even more compelling character. He’s reserved, quiet, educated, a skilled fighter, and a competent killer. He’s a study in contradictions – a strange mix of confidence and tightly guarded insecurities, eerily observant and yet so completely oblivious. He kills people for money and, I think, believes in what his Order was once tasked with accomplishing, but now questions what it has become. He’s honorable, is capable of great kindness and a man of his word, but he can also be calloused, secretive and dangerous. The situation and developing relationship with Ananna creates some moments of extreme vulnerability for his character, which makes him sympathetic and oh-so-very interesting. Romance. If you’re looking for overtly passionate romantic interludes and pledges of undying, eternal teenage love, look elsewhere. There are definitely the seeds of romance here, but it’s the hard won and slow-building kind… and ultimately the kind I love most. Ananna & Naji are two very different, very independent people with extremely different backgrounds and extremely different goals. Add to that the little fact that, oh yeah, Naji tried to kill her, and now they’re unwillingly, but inextricably linked by an impossible curse, it would be untrue to their characters to have their relationship develop any faster than it does – both of them a bit bitter and desperate that their futures and plans have been interrupted by this strange magic. It’s just really fun to watch as their initial animosity morphs into a grudging acceptance, into a tolerance into something a little more undefinable. It’s a slow-building simmer to be sure, but something about it tells me that when this pot finally comes to boil, it’s going to have been well worth the wait. aren’t exactly new ones, Clarke skillfully puts her own unique stamp on it, leaving me to wonder, worry and hope about how this is all going to turn out. The writing style did take a bit to grow on me, I’ll admit. Between Ananna’s “ain’t got none” brand of narration and Clarke’s somewhat sparsely descriptive style it took me a chapter or two to fully adjust and get into the story. But like I said, it didn’t take that long and it wasn’t something that bothered me. It’s just different, and in this case, different is good. Overall. 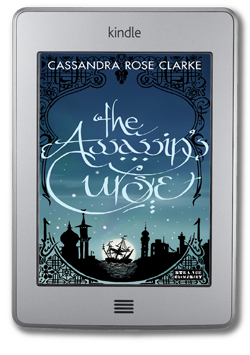 Full of action, adventure, romance, magic The Assassin’s Curse by Cassandra Rose Clarke is an engrossing and original fantasy debut… and a rollicking good time. This book looks so good!!! Assassins and pirates? Count me in! I’ve been seeing many positive reviews for this book, so I’m really excited to read it. Great review! Love your descriptions of the characters. Naji just sounds so mysterious. Yay! And thank you! It’s a fantastic book and Naji is pretty awesome. It’s definitely a series I could see becoming a favorite. Thanks for dropping in, Angie!